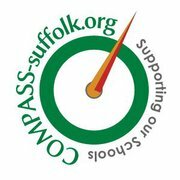 Last year a campaign group from the Stoke by Nayland area called Compass Suffolk (Community & Parents Actively Supporting our Schools in Suffolk) helped see off an application for a free school in Stoke by Nayland in wait for it - a closing Middle School. Like all of the other free schools the campaign to set the school up grew out of a desire to "save" the Middle School. Stoke by Nayland is 10 miles from Sudbury as in another direction is Clare which has the distinction of having the very first free school - Stour Valley Community School - which opened last September on the site of the former Clare Middle School. The bid was made by a parent group that (as at Ixworth) started off without even disclosing the names of the proposers. The group, Stoke by Nayland Academy Trust made what seemed a vague and unconvincing bid that the DfE rejected. However having lost the bid the Stoke by Nayland group decided to hand the project over to the Seckford Foundation and Seckford have submitted another bid in this year's round that closed on Friday. You can see more about the bid on the Stoke by Nayland Free School website but it is just the same as the other Seckford bids. Apparently debate "doesn't do either side any good" but I suspect it doesn't fit with the corporate communications strategy of the Seckford Foundation. Reading the comments on both "sides" you can see how entrenched this has become. This brings out one of the worst things about these free school proposals. They are divisive. They set parent against parent and school against school. One parent seems non-plussed as "a school is to all intents and purposes a business". If it doesn't do well it can just fail. Which I guess seems a better prospect when your child is attending the new "successful" school rather than attending a school that is now spiralling downwards due to a vicious circle of lost pupils and funding. 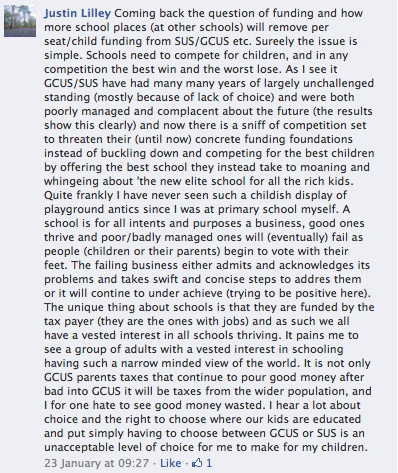 Also note the awful phrase "competing for the best children". Maybe he actually got closer to the truth with "the new elite school for all the rich kids". Sounds like that is what even he is actually predicting is going to happen. These Seckford Free School proposals seem to be taking advantage of a common set of circumstances. Middle School's closing and the parental uncertainty that causes. The availability of relatively cheap sites due to the closure of Middle Schools and the willingness of the DfE to fund development. Elements of dissatisfaction by some with local schools and people who feel that schools are "to all intents and purposes a business" who are prepared to talk down local schools and sometimes spread unsubstantiated rumours.